Hollyleaf Buckthorn is a member of the Buckthorn Family. 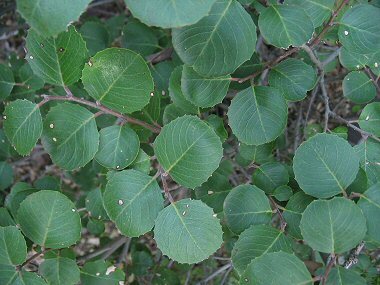 It appears as a large shrub or small tree to grows to 15 feet in height and has rough, dark gray bark with fissures and shiny round green leaves with small spiny teeth around the edges. The plant typically grows in chaparral covered slopes and ponderosa woodlands at elevations between 3000-7000 feet. The berries of the Hollyleaf Buckthorn are edible and were eaten by Native Americans. Hollyleaf Buckthorn typically blooms between March - May and produces tiny, yellowish green flowers to 1/8 in width, followed by a bright red berry to 1/4 inch in diameter.